_PBS2709, Jodhpur, Rajasthan, India, 2007, INDIA-10720. Boy in mid-flight. At the foot of the vast Mehrangarh Fort, one can find the Blue City, a small tightly knit maze of houses located towards the north of Jodhpur. 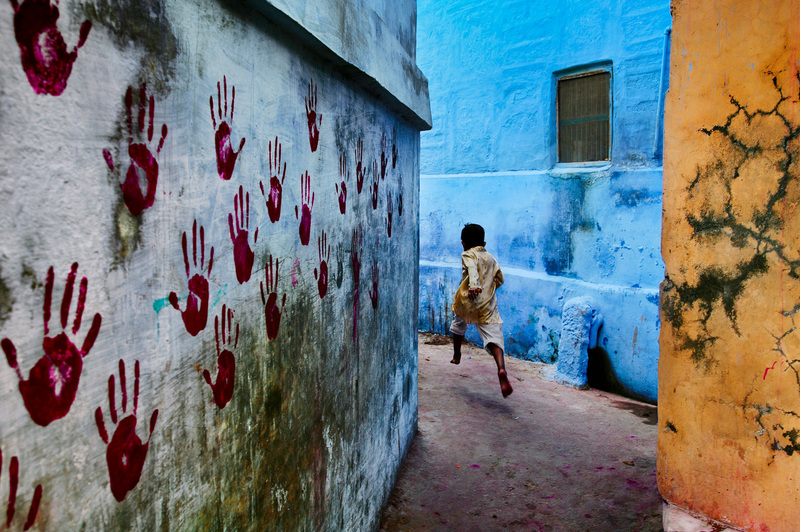 In one of the narrow alleyways a boy flees McCurry’s camera. Balancing three intersecting planes of colour – one of which is covered in stark red handprints – the image pulsates with energy as a young boy dashes through the narrow alleyways. At the foot of the vast Mehrangarh Fort, one can find the Blue City, a small tightly knit maze of houses located towards the north of Jodhpur. Balancing three intersecting planes of colour – one of which is covered in stark red handprints – the image pulsates with energy as a young boy dashes through the narrow alleyways. Phaidon, Iconic Image, Final Book_Iconic, page 6.